Student loan debt can be a major obstacle when qualifying for a home loan. The two largest issues that affect debt to income ratios on mortgages are student loans and car payments. 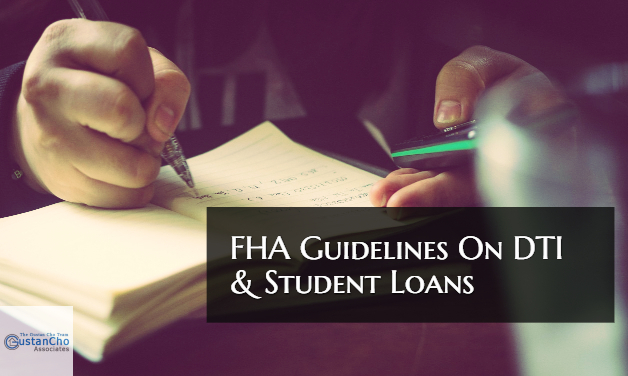 This new 2018 FHA Guidelines On DTI And Student Loans will effectively terminate borrowers being able to use IBR, income based repayment payment plans on their debt to income ratios for student loans. The good news is borrowers can contact the student loan provider and get a fully amortized monthly payment over an extended term (normally 25 years). Gustan Cho Associates Mortgage Group at Loan Cabin Inc. accepts Income Based Repayment (IBR) on conventional loans no matter how large the outstanding student loan balance is. The best solution for home buyers with higher student loan balances is to try to qualify on conventional loans versus FHA Loans. Not all lenders will honor a hypothetical amortized monthly student loan payment in debt to income ratio calculations. They will just take the 1.0% and use that figure in debt to income ratio calculations. Borrowers with higher student loan balances who need to qualify with a lender with no mortgage lender overlays can contact us at Gustan Cho Associates at 262-716-8151 or email us at gcho@gustancho.com. We have no mortgage overlays on FHA Loans, VA Loans, USDA Loans, and Conventional Mortgages. We are available 7 days a week, evenings, weekends, and holidays.